The Bodoki No-Mess Cutting Board drains and contains excess liquid while you're chopping, slicing and dicing, keeping your counter tops clean. The helpful reminders on either side - branded with a cow & carrot - eliminate cross-contamination of meats and veggies, another unique feature for this truly reversible board. 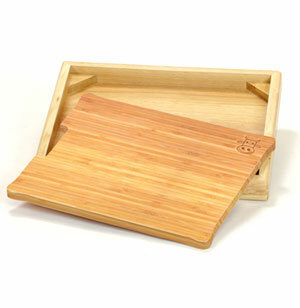 The board is made from bamboo and the basin from rubber wood, both sustainable resources. 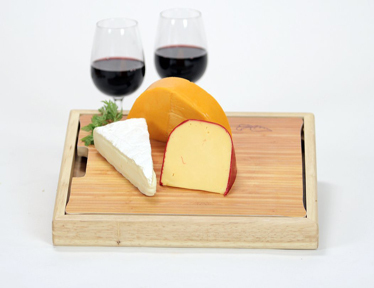 Best of all, the food-grade, sealed basin catches all of the spills, drips, and mess - making this the ultimate, no-mess cutting board. 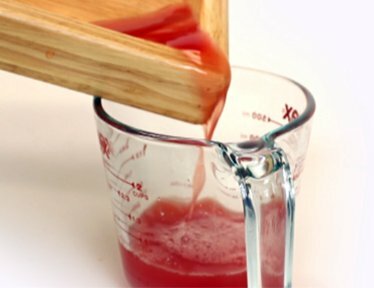 The ultimate, no-mess cutting board. Drains and contains juices from all four sides. Reversible - flip board for a clean surface. Durable, lightweight, and easy to use. Branded with a cow & carrot to help eliminate cross-contamination of meats and veggies. Made from bamboo and the basin from rubberwood, both sustainable resources. Food-grade, sealed basin catches all of the spills, drips, and mess. 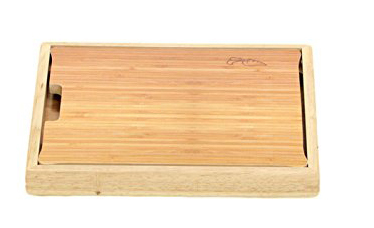 Board measures 14.25" x 12.25" x 1.75"